Every Creative Endeavor: The Big Announcement! Creative Bloggers Got Talent Contest! The Big Announcement! Creative Bloggers Got Talent Contest! 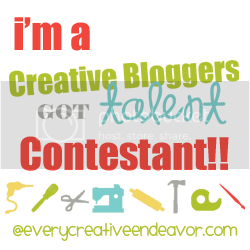 On February 6th – I am kicking off a new contest – right here at Every Creative Endeavor called Creative Bloggers Got Talent! Starting next Monday everyone will link up their ideas to a linky party for a few days for their chance to be a contestant. The party will close and voting by the public (so tell all your friends to come on over and vote you in!) will continue until Friday Night (8:00 MST). 20 winners will be announced on Saturday Morning. The 20 winners would then have to create a new project and email it to me by the following Saturday (Midnight). There are NO categories – so the sky is the limit every week – You can pull out all your tricks! Week Two: I will post the winner projects on Tuesday morning and voting will open up once again. This time the voting will be anonymous - But this is where three guest judges come in – They will look over the 20 entries and send me 4 they like and 4 they want to “X.” The likes and “X’s” will add and subtract a selected amount of points from each project. The voting will close on Friday at 6:00 MST and everything will be calculated and then 15 winners will be announced on Saturday morning. Week Three: Same as week two – look over 15 projects but only 10 winners would move on. The judges pick 3 likes/dislikes. Week Four: Same as week two – look over 10 projects but only 5 winners would move on. The judges pick 2 likes/dislikes. Week Five/Final Week – 5 winners compete for first, second and third. I told you they were fabulous! The top three winners will be announced on Saturday, April 14th . There will be three prize packages! I am still working out all the kinks but think about all my favorite companies that supply you with amazing products! Way Cool!! I know, right! So – are you ready for this fast paced- no limits -totally awesome- pull out all the stops contest ? I am giving you a week to get your projects together and I hope to see you all here! Oh and just a favor real quick – will you all help me spread the word!? OOPS! Thank you for pointing out my mistake! Your projects should be done AFTER December 1st - so between December 1st and Feb 8th when the linking party ends! Good Luck everyone!! So excited for this fun competition! !